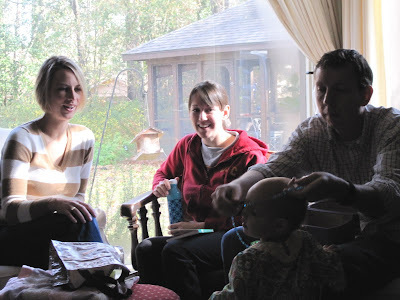 We had such a good time visiting with Todd's family in Mississippi. I can't get to everyone, but here are some of the highlights. Gramps, Todd's Dad. Go Go, Todd's stepmother. Uncle Mike, Todd's brother. (Yes, Avery is finally getting some hair back there. No, I can't control it.) Aunt Bebe, in the background. Uncle Mike and Aunt Bebe painted and decorated the jewelry box Avery just opened here. She instantly learned to say "beads" and wears as many as she can as often as she can. She is showing signs of her inner girly girl. Yeah! Matt, Todd's BFF, and Molly. This is the first time I've really seen Avery PLAY with someone. She is usually busy with her own parallel play, but Molly and Avery hit it off. Here they are pretending to nap on a foam pad. They would run over, lay down, and say "night night." Too cute! Too bad Molly lives so far away.